In the end I enjoyed my son’s Chanukah party, despite getting ten calls from home on my cell-phone during the hour-long event. My son had a good time too. But while the other parents were admiring the display, I was checking for fire exits. I noticed that the windows in the gan had burglar-proof bars and there’s no way that all of those fathers with the video cameras and the mothers with the high heels, not to mention the grandmothers and the big sisters holding babies (but no toddlers), could get out the door in case of fire. At the gan party of one of our older children, the construction-paper candle pinned to a girl’s shirt (similar to that in the picture above) caught fire from the real candle she was holding. Fortunately, the girl (and the rest of us) escaped and only her shirt was damaged. It’s madness to let four-year-olds walk around a crowded gan with lit candles. 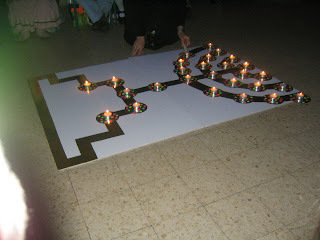 During the party last week, the children placed their unlit candles (tea lights mounted on a decorated CD) on the poster, and the staff lit them afterward. So while I think candles in gan should be banned, we have progress. And on a different note, when will Israelis discover the safety pin? They still use straight pins to attach those candles to the kids’ shirts. Emah–I know what you mean. Safranit–they probably have seminars where they trade ideas. ooh, so cute. And yes, the candles in the kids’ hands gives me the willies. And, mind you, the Eldest lights our menora himself at home, but there’s only ONE of him. Far less chaos, far less opportunity for budding arsonists, accidental or otherwise. We let 3yos light too, but this year my youngest did not insist on it, surprisingly. KM–Thanks for stopping by! Hope you are feeling well.